During our briefing at the Geelbek homestead, Mel pointed out a Rock Kestrel picking up stones in the carpark. He explained that these would be swallowed to help grind food in its gizzard. 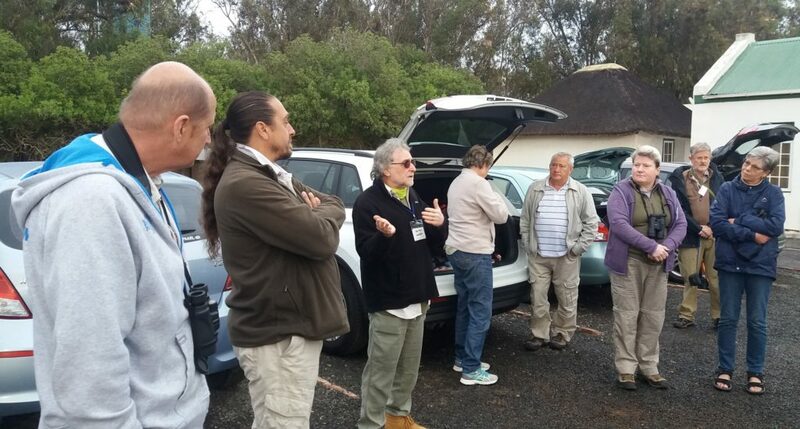 At Seeberg we met up with Club members who’d had spent the night in Langebaan. There was no way we could all fit in the hide, so some scopes were set up outside and luckily the birds didn’t seem bothered by our presence. 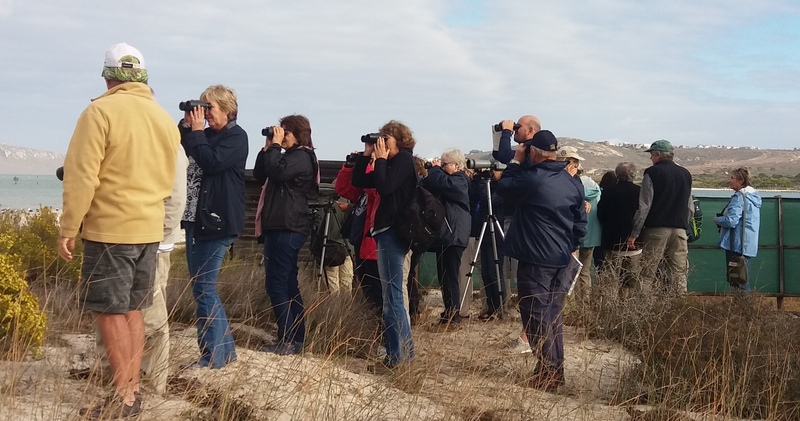 Mel, Vernon and Simon Fogarty went out of their way to ensure that everyone had a good look at the different waders and the five species of Terns in the scopes. Complete novices, as well as old hands, all came away happy under their patient tuition. 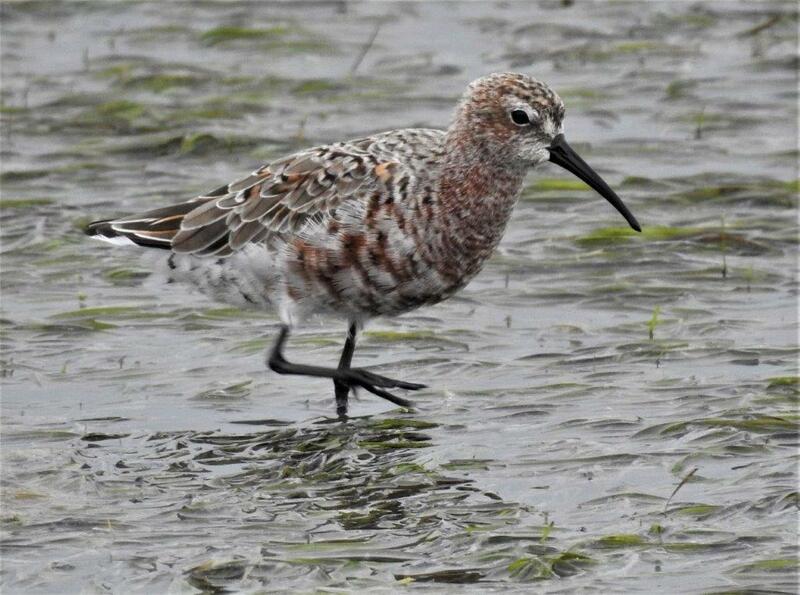 Many of the migrants were sporting signs of their Northern breeding plumage and the Curlew Sandpipers and Red Knots were especially colourful. Some transitioning Little Terns looked decidedly odd, their normally dark bills now yellow/orange with just a black tip and yellow legs, full breeding plumage. The next stop involved a 15-minute walk through fields of Eland droppings to the salt pan inland of the homestead. 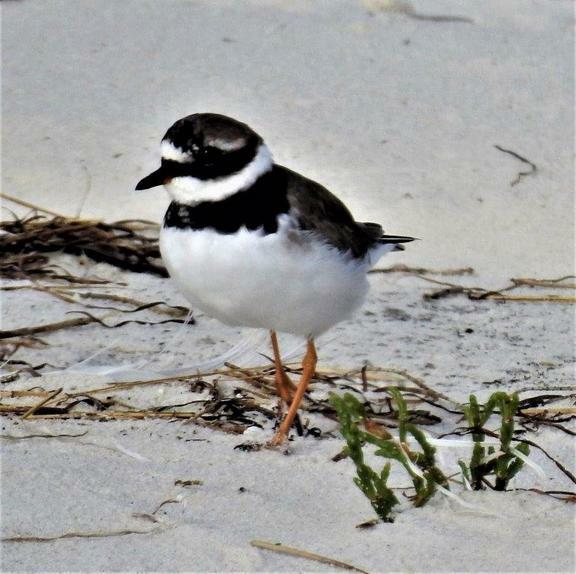 As it was neap tide, the water was low and the waders very far away, so we didn’t add any new species to the day list, scopes notwithstanding. There is talk that we may soon see a new hide at the pan. 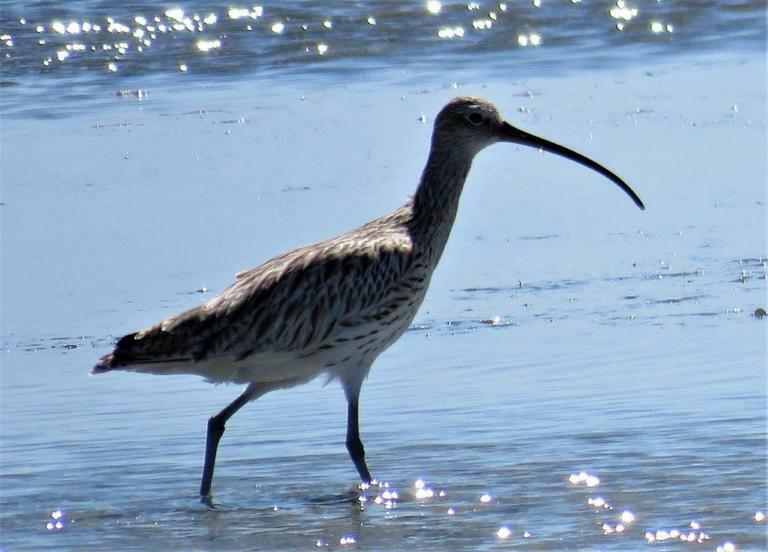 The Honorary Rangers mentioned the possibility at the Wader Bash and a prospective sponsor came forward at that event. Interestingly the rangers were unanimous that the old hide (now demolished) had been badly positioned and the new one would be erected in a more favourable spot. Let’s hope this comes to fruition as it would be a great asset to the park and could result in the rarities, for which the area is famous, being easier to find. 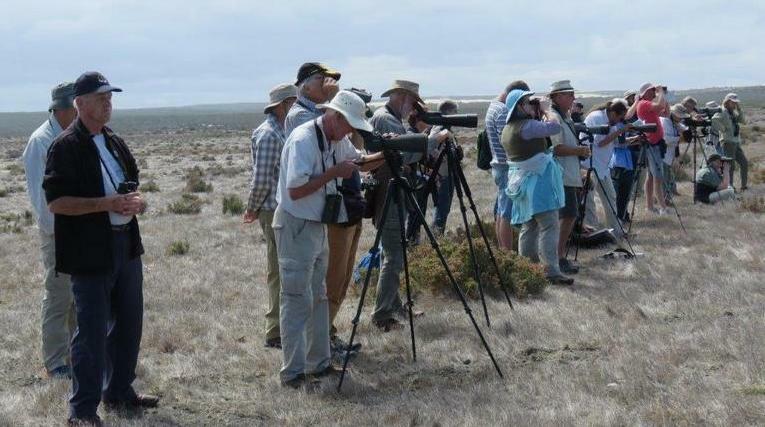 After lunch under the trees and some bush birding in the avenue, everyone moved to the Geelbek hide. 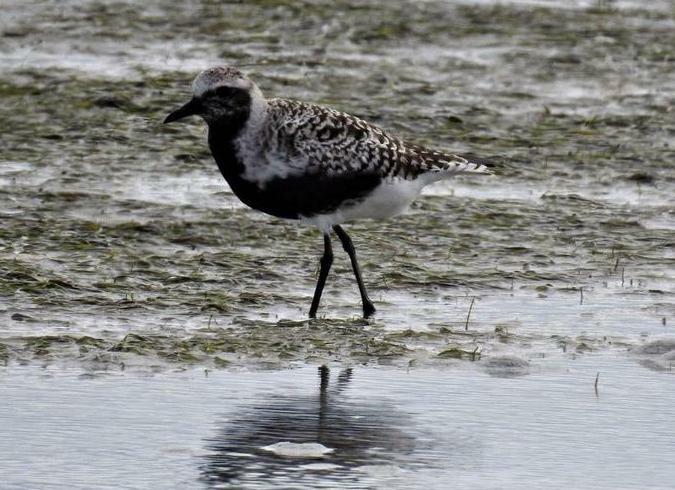 It was strange to see the Grey Plovers in breeding plumage looking very much like Blacksmith Lapwings at first glance. 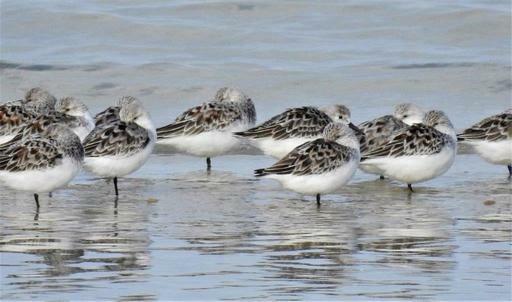 We were lucky to get several good sightings of Chestnut Banded Plover, Eurasian Curlew, Red Knot and Ruff, but alas the current specials (Lesser Yellowlegs and Broad-billed Sandpiper) eluded the group. A truly memorable day spent wishing those the courageous little travellers a bon voyage. We hope to see them and their youngsters back here in the Spring.